The previously unnamed test and evaluation ship has now a name and a pennant number: A-591 TCG Ufuk. The ship, the first one in Turkish Navy to bear that name, was launched on 9th February 2019. Two most obvious differences between this ship and the Ada class corvettes are that that TCG Ufuk doesn’t have any weapons. The test and evaluation ship does have a flight deck to support 10-tonne class helicopters but does not have a hangar. According to news reports, TCG Ufuk will have an all diesel main propulsion whereas the Ada class ships have a combined gas turbine and diesel engines as main propulsion. The top speed is given as 18+ knots, which is considerably slower than 29 knots top speed of Ada class corvettes. 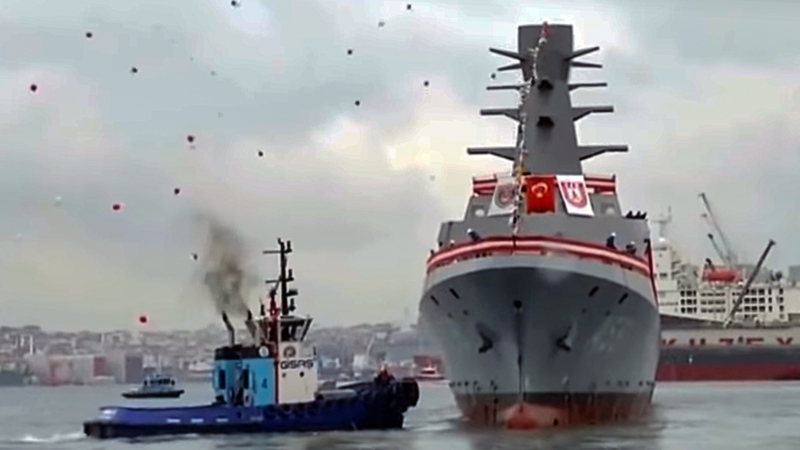 During the launching ceremony, the President of Turkey Mr. Erdoğan told that this ship was the first intelligence gathering ship built by national means and mentioned the importance of signal intelligence. The intelligence gathering mission of this ship may explain why the ship will have a 100 tons more displacement compared to Ada class corvettes despite having no weapons and the sensors associated with fire control and why its construction was not published much compared to other defense industry projects. The commissioning of TCG Ufuk is scheduled for July 2020. A CGI image of the Test and Evaluation Ship showing her general configuration. The lack of weapons, the enclosure of the section between the funnel and the mast are particularly striking features. The project was first made public in a presentation made by Undersecreteriat for Defence Industries, (SSM) during the 7th Naval Systems Seminar in 2017. SSM simply told that they have signed a contract for a Test and Evaluation Ship. More information was released in a presentation made by the engineering company STM during the same event. According to STM, they are the main contractor of a project, where one Test and Evaluation Ship (TaES) will be constructed by Istanbul Denizcilik Shipyard. 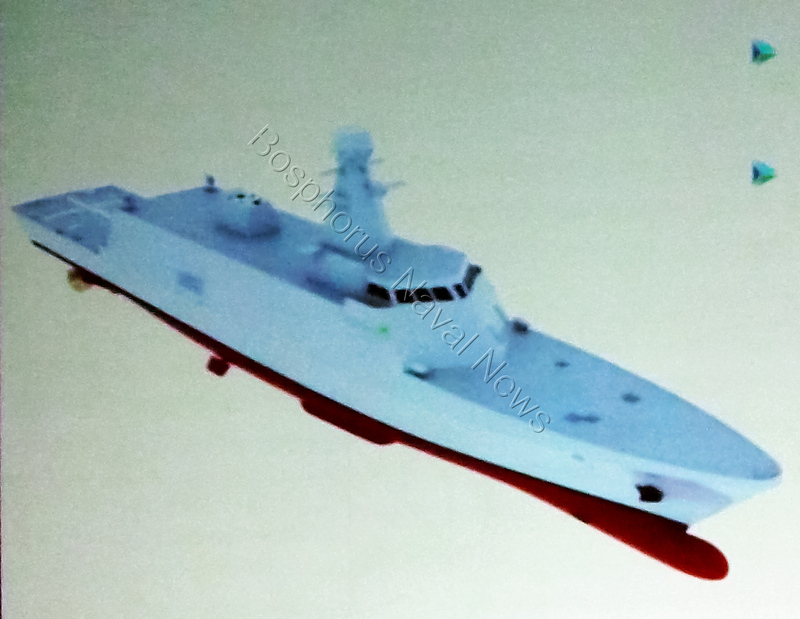 The ship will have hull form of Ada class corvettes. Aselsan, as a subcontractor is responsible for the manufacturing of the mission systems to be used on board. STM also shared the above photo. The ship showed there has a striking resemblance to Ada class corvettes. Two most obvious differences between this ship and the Ada class corvettes are this ship doesn’t have a gun in A position and any other weapons. The space between the mast and the funnel, where 8 Harpoon missiles are installed in Ada class ships doesn’t exist in the TaES. The aft of the superstructure is also slightly different. The superstructure aft of the funnel is larger since the TaES doesn’t have the STAMP remote-controlled gun system and anti-torpedo countermeasures system, the deck on which these systems are installed is added to the hull. According to news reports, the TaEs will have an all diesel main propulsion whereas the Ada class ships have a combined gas turbine and diesel engines as main propulsion. The top speed of the TaES will be lower than Ada class corvettes. Since TaES shares the same hull and superstructure of the Ada class corvettes, I believe the physical measurements of the TaES will be same or very similar of Ada class ships. 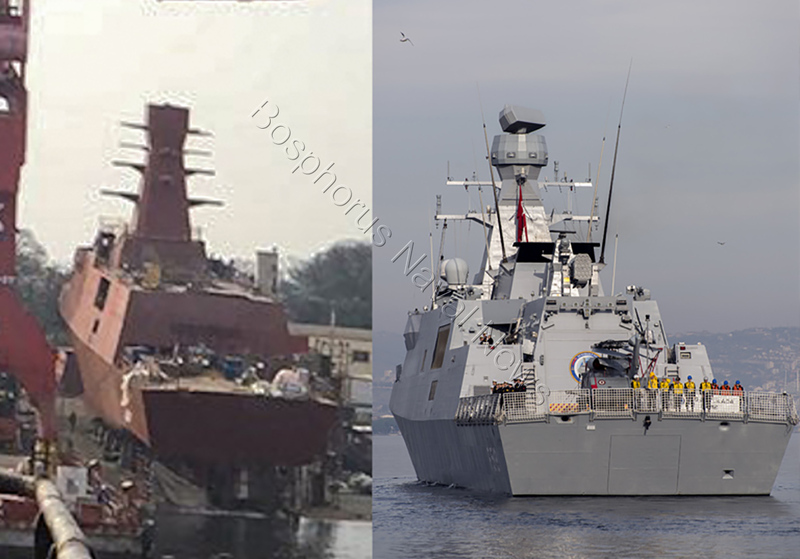 On the left are the mast and forward superstructure of the first Ada class corvette TCG Heybeliada. On the right are the mast and the forward structure of the Test and Evaluation Ship. 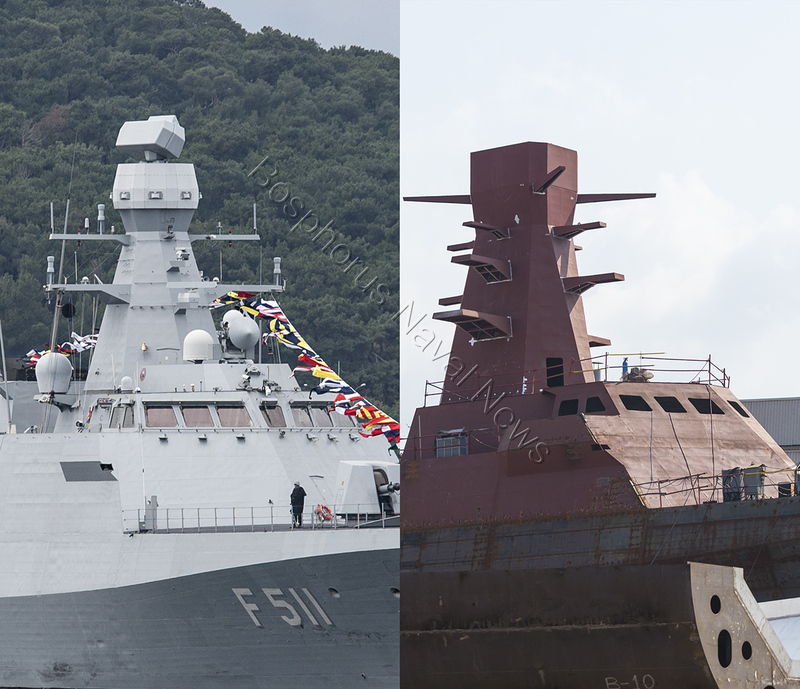 Although the shape is similar, the number of supports on the mast of the TaES is much more compared to TCG Heybeliada. Obviously, more sensors will installed on TaES. The stern view of the TaES and TCG Heybeliada. The TaES does have a flight deck and a hangar. But the shape of the superstructure at the aft is different.